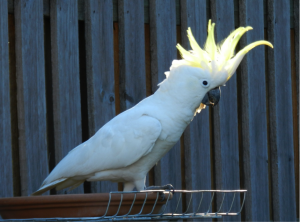 Sulphur-crested Cockatoos are striking white birds with a spectacular yellow erectile crest. This has led them to becoming well known, and often found in captivity. However, Australia’s answer to the nightingale has a loud, harsh grating call that is equally well-known. The call is sounded by “sentries” who post themselves around feeding flocks. The damage they cause to crops has led them to be regarded as a nuisance by farmers. Sulphur-crested Cockatoo. Photo: Brian Furby. gathered from the ground and from trees, and, to some extent, insects and their larvae. They are considered a pest because the dig up seeds, eat ripening heads of grain and stock feed. They often damage stored hay and grain by opening sacks and plastic-covered bales, and chew installations such as wooden window frames. They often forage in large flocks in the early morning and evening, resting in trees through the heat of the day. At night they roost in traditional roosting areas. They are strong fliers able to forage several kilometres from roosting or nest sites. Breeding occurs from August to January. They are hole-nesters, lining the tree-hollow with a bed of woodchips. Nestlings remain in the hollow for 2-3 months where they are fed by both parents. After fledging they remain with the parents for several more months by which time the family will often have joined a locally nomadic flock. The nominate race (C. g. galerita– Latham, 1790) is the only subspecies found in South Australia. 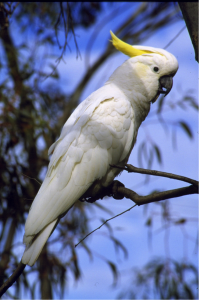 Sulphur-crested Cockatoos are large white cockatoos with a yellow wash over the ear coverts, and the undersides of wings and tail. The long, bright yellow crest becomes extremely noticeable when extended and is diagnostic. The bill is black, and the legs and feet dark grey. The eye has a white eye-ring and the iris is dark brown in the male and red-brown in the female. Apart from this difference in iris colour the sexes are alike. Juveniles are like adults but have a pale underdeveloped crest and a pale brown iris. Chicks have a sparse yellow down. 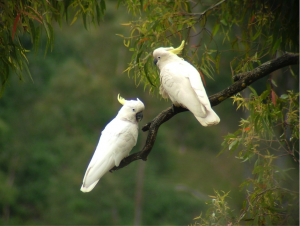 Sulphur-crested Cockatoos inhabit forest, woodland, cultivated cropland and urban areas where they are typically an edge species. They are common along the Murray river, and in the south-east. They are moderately common in the Adelaide plains including Adelaide itself and in the Mount Lofty Ranges; in the Murray Mallee, the mid-north and southern Flinders Ranges they are uncommon, and in the rest of the state they are rare.